How to SELL & Make Money!! Clean out and CA$H in! Read our NEW Consignor Guide to help you get started! We'll give you all the tips & tricks to maximize your consignor check. ....and your check is ready 2 weeks later! You make 60% of your sales and you set the price of each of the items you put in the sale. A consignor fee of $10 will be deducted from your consignor check. Consignors who help at the sale make 70%! And those who help for 8 hours or more get their consignor fee waived too!!! JBF is truly a collaboration of parents helping each other to make and save money while caring for our children. 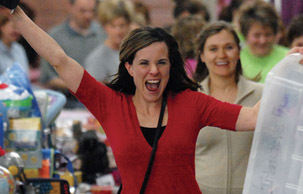 When each Consignor helps out just a little bit as a Team Member it creates an amazing community event for everyone! Come Join Our Team...It's a lot of fun! Team Members shop before the general public and you get first pick from the best of the best! Team Members also earn 70% on their sold items and earn a presale pass to shop the 50% off sale before the public!! Helping out with Just Between Friends is a fun experience and an awesome privilege! You may choose to hep out for as many hours as you would like!! 4 hours will earn you 70% and with 8 hours or more, we will also waive your consignor fee! *You can bring one guest & children are OK.
Bring your items tagged, prepped, and sorted by type & size. Please read over the NEW Acceptable Items listing. You will place your items directly onto the sales floor (inspection will now be done after drop off ends)- plan for 30 mins to an hour. Pick up your Presale Tickets and get ready shop 'til you drop on Wednesday, May 1st! Sunday, April 28th 12pm-4pm or Monday, April 29th 4pm-8pm & Click HERE to schedule an appointment. All items not picked up by 9:01pm 5/5, will be donated. Consignors & Team Members ALWAYS shop FIRST! Saturday, May 4th Half Price Presale! Kids are welcome during all Presale shopping times. Please use caution as the Presales can be overwhelming. Children worn or in strollers/wagons are best. Children must stay with the parent at all times, please. Presale Passes: Consignors/Volunteers will receive a Presale Pass at Drop Off. Check for recalls (pink TOOL below). Use ONLY clear packing tape to attach tags to books. Do not use scotch or masking tape. Place small parts/accessories belonging to items in Ziploc/plastic bag. Tape bag shut with clear packing tape. Fasten the bag securely to the item with clear packing tape, safety pin or small zip tie. Items must include ALL parts. Multi-piece items may be attached together with zip ties. Cribs: Just Between Friends can only accept the consignment of cribs manufactured on or after June 28, 2011. Cribs manufactured from July 23, 2010 to June 28, 2011 may be consigned if the consignor provides a certificate of compliance from the crib manufacturer or retailer. Cribs manufactured prior to July 23, 2010 will not be accepted under any circumstance. Cribs that are unacceptable, for any reason, cannot be sold as toddler beds. All cribs consigned with Just Between Friends must have a signed crib waiver from the consignor. You must review the Crib safety guildelines and fill out a crib waiver. You can view the certificate of compliance requirements at http://www.cpsc.gov/about/cpsia/faq/elecertfaq.pdf. You can view the new crib standards at http://www.cpsc.gov/onsafety/2011/03/the-new-crib-standard-questions-and-answers/. Note: DO NOT use clear packaging tape to attach tag to an item that is made of cotton-like material (i.e. bouncy seat, pack ‘n play) the tag will fall off! Note: If selling multiple items together, include how many items on tag. Car seats,car seat bases, and booster seats typically cannot be older than 5 years old (5 years and 0 months). Some models do not expire in 5 years. 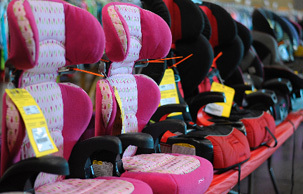 Click HERE for car seat recalls or call 1-800-424-9393. All car seats, boosters, car seat bases, and infant carriers that function as a car seat with a stroller combo will be inspected after Drop Off. Please click HERE to download our Car Seat Checklist that must be submitted for each car seat, base, booster seat that will be consigned. Note: You MUST attach completed car seat waiver to the car seat and instruction manual. You can place carseat waiver and instruction booklet into Ziploc bag and safety pin to car seat. Items without a waiver/manual will be removed from the sales floor. Bedding may be placed in XL Ziploc/clear bag or tied securely together with ribbon/clear packing tape. Bedding with matching accessories may be placed in XL Ziploc/clear bag or tied securely together with ribbon/clear packing tape and tagged to sell as a set. You may sell matching lamps and room decor with your bedding set but we recommend selling them separately. Note: DO NOT use clear packaging tape to attach tag to an item that is made of cotton-like material (i.e. comforter) the tag will fall off! Shoes – near perfect condition. We are accepting NB to Adult sized shoes. Junior Clothing – We are accepting ONLY 10 total items for all junior sizes. Maternity Clothes – All seasons accepted. 5yrs or newer and only great brands as follows- Due Maternity, Motherhood Maternity, Isabella Oliver Maternity, Euphoria Maternity, Pickles & Ice Cream Maternity Apparel, A Pea in the Pod, Belly Dance Maternity, Unbuttoned Contemporary Maternity, BellaBlu Maternity, Posh Maternity, Crave, Destination Maternity, Mimi, Gap and Old Navy and other boutique clothes. Check for stains, holes and tears. Button all buttons, snap all snaps, zip all zippers. Sleepers, gowns, and onesies should be placed in Ziploc bags and securely taped shut with clear packing tape if being priced under $3 (you may place multiple items in a bag but please make sure the bag is not overstuffed). Size 24 months and above must be hung on a hanger. Sort all clothing by gender and size for easy drop off. Child size PLASTIC hangers are required or 3T and under. Only PLASTIC hangers are accepted. When hanging pants, attach safety pins to the TOP part of the hanger to ensure that pant will not slide. We attempt to remove hangers from the hung clothing items that are sold. These hangers will be available to consignors on a first come first serve basis during pickup. Hangers can be found inexpensively at most discount stores such as Wal-Mart, Target, the Dollar Stores, and thrift stores. Several department stores will give you leftover hangers...call them toward the evening hours (Old Navy, Carters Fred Meyer, Shopko, Children's Place, etc). If hanging shirt and pant set on 1 hanger, safety pin thru both clothing pieces AND through the top of hanger (this will prevent pants from weighing down the shirt and causing a possible tear). DO NOT safety pin pants to the bottom of the shirt OR bottom of the hanger. Rubber band or zip tie hangers together if selling multi piece items on multiple hangers. (remember to safety pin items together) Tag Gun: If you are interested in ordering a tag gun, please let me know (I have many many brand new Arrow tagging guns and tagging supplies). Remember to be very careful when using a tag gun and tag through the size tag or inside seam, since we will not accept clothing with holes. Tag Location: Attach tag with a safety pin/tag gun to the LABEL OF SHIRT or UPPER RIGHT SIDE OF PANTS. (you may also safety pin tag on upper right side of shirt, as you are looking at the item) Make sure you can see the tag easily. If you use a tag gun, insert the gun in label or inside seam NOT through part of the clothing (to avoid making hole/tear in garment). PULL on the tag to make sure it is properly secured and will not come off easily. You can reinforce the tag by taping over the platic tag to the label (import for higher priced items). Tags MUST be pulled out (not tucked inside clothing) so they are easily visible. Note: Sets sell well so match things up if you can. Make sure that the sizes are the same. If you have more than three unacceptable JBF items (stained, damaged, incomplete, or recalled) that are pulled at drop off or during the sale, your consignor number will be eliminated from our “Perfect Inspection” list. Then at the next sale you will have to go through a detailed inspection process. The “Perfect Inspection” list will be posted on the JBF site after the sale. If your consignor number appears on the list then you will bypass the inspection at the next sale saving you serious time at drop off. We appreciate those consignors who spend the extra time at home ensuring that their items are high quality and tagged correctly! Although we do have a recall specialist on site during consignor drop off and we provide the latest recall information on our website, ultimately it is the responsibility of our consignors to make sure all of their items meet the required safety standards. Despite our best efforts during inspection at consignor drop off, occasionally unacceptable JBF items such as stained, incomplete, defective or recalled items are over looked. These items will continue to be immediately removed from the sales floor and cataloged (see Perfect Inspection Policy). Consignors may claim these items in the designated area at consignor pick up. This process will help make us aware of those consignors who are not following JBF guidelines. To avoid loss of consignor privileges, please take the necessary time to carefully inspect all of your items BEFORE consignor drop off. VALET TAGGING-NO TIME TO TAG YOURSELF!?! VALET SPOTS ARE FULL for Spring Event (May 1-5). Let JBF help!! You will earn 45% and JBF does all the tagging for you! Do you have at least 100 items ? Are 80% of your clothing items quality name brand? (Less than 20% of your items are Circo/Garanimals)?